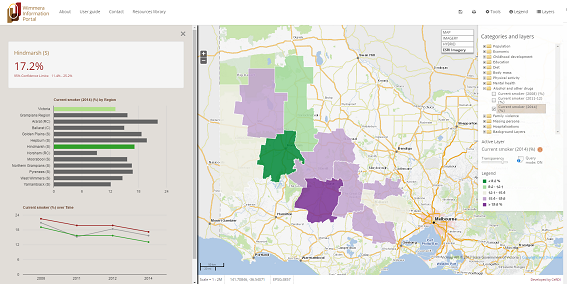 The Wimmera Information Portal (WIP) is a collaboration between the social, health and community services arenas within the Wimmera region to help address systemic disadvantage. WIP is an online portal which brings together existing social, health and wellbeing datasets and information created and managed by government agencies, organisations, community groups and individuals to inform planning, decision making and response strategy development. Evidence suggests that addressing systemic disadvantage requires interagency collaborative practice to facilitate development and implementation of holistic and coordinated responses to complex social, community and health issues. Despite strong evidence around the importance of collaboration for addressing systemic disadvantage in the social, health and community services arenas attainment of this goal has always been problematic. The difficulties encountered are linked to organisational, sector, professional and funding differences, and the tendency for the creation of domain specific silos, despite issues being linked, multifaceted and spanning a range of service areas. In regional areas, there is the desire for local government planning and targeted decision-making for community, health and social services. Despite large amounts of data being publicly available it is held by a variety of government agencies, organisations and community groups with no method for integration. An enhanced ability to use multi-sectoral information to build a holistic response to, and understanding of, linked issues (social, environmental, educational, health etc.) was viewed as a needed development for the Wimmera region. The ability to capture all of this data through a single point of access (using federated data) from which to build a knowledge base and support informed decision making and enhanced practice capacity has been embraced by the WIP, as was data currency (interoperability) to accurately map and better understand the unique aspects of the Wimmera area. 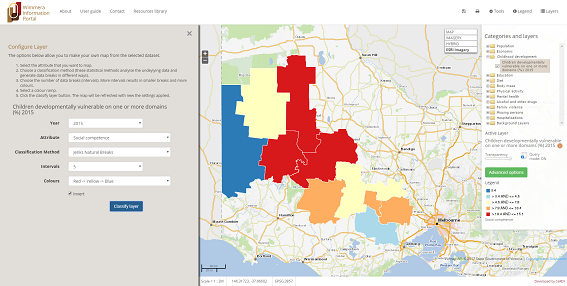 The WIP provides a single point of access to extensive information from a variety of datasets across the Wimmera region, using spatial mapping to enhanced usability and integration of data from a variety of sources. 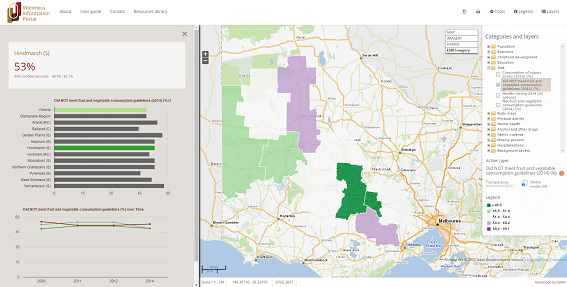 Victoria Police recently provided aggregated and de-identified data for the Wimmera region over a 10 year period from their LEAP database on some key focus areas. Technology innovation in the social services sector has mainly occurred in frontline service delivery and has been siloed to the specific field of practice. This project recognises that complex questions can only be answered through interagency integration and collaboration, which technology can provide a mechanism for. There is currently, to our best knowledge, no other web-portal that integrates data from a range of publicly available, as well as limited access, agency datasets to enhance the ability to make effective response strategies within the health, social and community services arenas. The information accessible from the WIP is federated from datasets held and managed by the individual agencies / custodians. Spatial rendering is achieved through CeRDI’s spatial infrastructure expertise which is based on open source software and related technologies. The development of the WIP has occurred quite organically. Issues of systemic disadvantage, particularly related to rural disadvantage were recognised by a number of agencies within the Wimmera. CeRDI was engaged to help enable, through the use of technology, easy access to datasets and interagency collaboration, as well as impact research over time. The development of the portal has involved several meetings with project partners to discuss ideas, datasets and functionality. The pilot portal has provided a channel to highlight and uncover new data sets, knowledge management needs and collaboration opportunities. This has informed priorities and areas for future development. CeRDI is currently working to develop pragmatic research funding through partner organisations as well as other funding opportunities to enhance the sustainability of WIP going forward. Data to be federated within the portal into the longer term will be drawn from a broader range of data sets and focus on demographic characteristics, families, children and young people, health conditions and behaviours, social determinants of health and mental health and wellbeing. In addition to publicly available data, it is hoped that agencies will be able to contribute aggregated de-identified data from their internal datasets to further add insight. It is thought that having access to local datasets at regular intervals would allow agencies to see the effects of their interventions more rapidly and allow them to respond to local need in a timelier manner, rather than waiting two years for data to be released. This enables a place-based response and enhanced response. Work will be conducted on portal functionality to enhance to ability to compare and correlate datasets. It is hoped that reporting mechanisms can be developed within the portal to help agencies assess health indicators, measure outcomes and analyse trends over time to aid their planning and decision making.